For this #ThrowbackThursday I’ve decided to look back at the second half of my recent North America trip. I had every intention of keeping my “Beer Diary” up to date as I traveled across California, I really did! But once I got a car to begin the final road trip, the blog was forgotten. I’m not sure why, something to do with the massive amounts of driving, exploring, and brewery hopping I was doing I guess. So here are some stats from the trip instead, as well as a few awards. Enjoy! Most Popular Beer Style: No surprises here – my favored beer style while travelling across the west coast of the US were big hoppy monsters. In total there were 13 American IPA’s and 16 Imperial/Double IPA’s. Let’s just call it 29 hop bombs, which is about one third of my total North American beer consumption. Yep, I like hops. Most Popular Brewery: Figueroa Mountain Brewing in Santa Barbara takes this award, providing me with 13 of my new brews during a great afternoon of beer tasting. Best Beer: This is a tough one – really tough. The amazingly luxurious ‘Goose Island Bourbon County Stout’, fresh off tap in Vegas, was rightfully holding the title of ‘best beer’ up until the second last day of the trip. Then I visited the Blue Palms Brewhouse in Hollywood, and was handed a glass of ‘El Hefe Anejo’ – an Imperial Hefeweizen that had been aged for nine months in Tequila barrels. Picture all of the beautifully sweet agave flavours you expect from a fine tequila, minus the stomach churning, throat burning booziness that typically follows. Mix that with the banana esters and some oak notes, and you end up with a unique and extremely tasty brew. Worst Beer: Corona Light. Don’t hate on me for trying this abomination of a ‘beer’. I was just curious to see how much lighter a ‘Corona Light’ could be than a normal ‘Corona’. Turns out it’s possible to remove flavour from a beer that’s already flavourless to begin with. Must be magic or something. Best Beer Experience: My day trip from LA to San Diego. From the coastline views on the train ride down, to the visit to the Stone Brewing Liberty Station, to the guy getting tasered and arrested for drunken behaviour on the train ride back – it was and excitement filled day from start to finish. PLENTY of tasty beer as well. 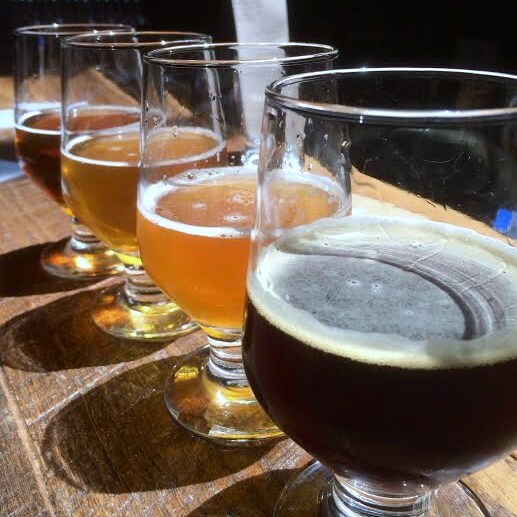 Worst Beer Experience: The beer scene in Los Angeles. Considering the rest of California had me tripping over good beer/breweries everywhere I went, LA was a veritable desert of good beer. There were a few gems, but overall it was pretty disappointing. Best non-beer experience: The drive along Highway 1 from San Fran to LA. Some of the most amazing coastline you’re ever likely to see. I took my time, doing this trip in five days, but I wish I’d stretched it out longer. I would’ve loved to have spent much more time exploring the awesome coastal towns of Santa Cruz, San Luis Obispo and Santa Barbara. I’ll be doing this again one day. Worst non-beer experience: Los Angeles. It just didn’t grab me the way the rest of California did. It’s the most difficult city to get around in when you’re relying on public transport, and it’s sooo spread out. I saw some cool things (Santa Monica pier was a highlight, but we needed a car to get there), but overall it just left me wanting. ← Why settle for one when you can have…five! Full credit for remembering so much while averaging nearly 4 beers a day. I probably would have forgotten my name.